IN THE WORDS OF THE WINNER – “It was kind of interesting because when the No. 42 (Kyle Larson) was there, it just created an environment to run the top and I wasn’t as good on the top. The No. 42, not being up there and that first couple of cars; the bottom was really where it was at for the short run. This Lowe’s Chevrolet was flying! · Jimmie Johnson won the 57th annual Food City 500 Monster Energy NASCAR Cup Series race at Bristol Motor Speedway Monday afternoon. For Johnson, it is his 82nd victory in 551 Monster Energy NASCAR Cup Series races. It is his second victory of 2017, and his second in as many races. · It is Johnson’s second win in 31 starts at Bristol Motor Speedway. His initial win there occurred on March 21, 2010. Johnson has now amassed 18 top-10 finishes and 15 top-5s at Bristol. · It is Johnson’s 16th straight season with at least two wins. · Clint Bowyer (second) posted his 11th top-10 finish in 23 races at Bristol Motor Speedway. It is his best finish at Bristol. It is also his best showing overall since he finished second on April 27, 2013 at Richmond. · Kevin Harvick (third) posted his 16 top-10 finish in 33 career Monster Energy Series races at Bristol Motor Speedway. It is his best finish of 2017 and he has now finished in the top-4 in the last two races. · Ty Dillon (15th) was the highest finishing rookie today. 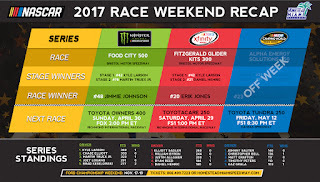 · Kyle Larson won Stage 1 of today’s race, while Martin Truex Jr. captured Stage 2. · Kyle Larson (360) leads the point standings by 27 points over Chase Elliott (333). They are followed by Martin Truex Jr. (323) and Joey Logano (291). · Through eight races of the 26-race regular season, six drivers have qualified for the 16-driver field of the 2017 Monster Energy NASCAR Cup Series Playoffs, a list consisting of Kurt Busch, Brad Keselowski, Martin Truex Jr., Ryan Newman, Kyle Larson and Jimmie Johnson, each of whom has won at least one race this season. The Playoffs culminate with the Ford EcoBoost 400 championship finale on November 19 at Homestead-Miami Speedway. 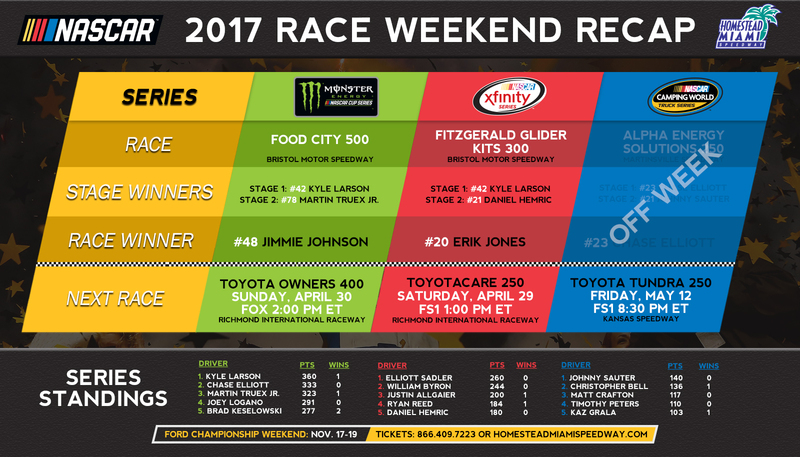 · Erik Jones won the 35th annual Fitzgerald Glider Kits 300 NASCAR XFINITY Series race at Bristol Motor Speedway on Saturday afternoon. It is Jones’ eighth victory in 64 career NASCAR XFINITY Series races, and his second in-a-row. · It is his second victory and fourth top-10 finish in five career XFINITY Series races at Bristol Motor Speedway. · Ryan Blaney (second) accounted for his fourth top-10 finish in five career XFINITY Series races at Bristol Motor Speedway. It is the second straight XFINITY Series race in which he has finished second. · Daniel Suarez (third) posted his fourth top-10 finish in five career XFINITY Series races at Bristol Motor Speedway. · Kyle Larson won Stage 1 of Saturday’s race. · Daniel Hemric (fifth) was the highest finishing rookie. He also captured Stage 2 of Saturday’s race. · Elliott Sadler (fourth) was the highest finishing XFINITY Series regular in Saturday’s race. · Elliott Sadler (260) leads the XFINITY Series points standings by 16 points over rookie William Byron (244), winner of the 2016 Ford EcoBoost 200 Camping World Truck Series race at Homestead-Miami Speedway. They are followed by Justin Allgaier (200), Ryan Reed (184), Bubba Wallace (180) and Daniel Hemric (180).